Tamper sleeper replacement machine waits in the siding. The day dawns bright and fine at Marian Mill, west of Mackay, in November 1989. 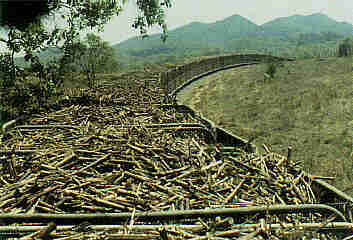 The cane crushing season is nearing its end and many fields have been harvested, with plant cane or ratoons less than a metre high, giving a clear view of the scenery, the surrounding fields, and 2ft gauge cane trains. Early in the season the fully grown cane can be 23 metres high, so your view can be limited. The humid air, reeking of the unmistakable sour molasses smell of a sugar mill, hangs heavily. It will be hot by the middle of the day. A good hat and good footwear are important to counter the twin dangers of skin cancer and snakes in the grass. At 7.00am, in the mill loco depot, the fitter and loco crews check over the hardworking locomotives, ensuring that the brakes and drive systems are OK, and that sand, water and fuel supplies are on board. Some locomotives, mostly the larger ones, have worked through the night shift and will go straight back out after being handed over, but the others have been parked in or near the loco shed overnight. Marian's main cane haulage fleet is made up of Clyde 060DH locomotives (three 18ton and two 24ton) and two 32 tonne Baldwin bogie locomotives, with an 18tonne ComEng 060DH inherited from North Eton Mill which closed last year. The crews check with the Traffic Office as to their workings for the day. Each locomotive has a set run, but the particular delivery points and the number of bins to be delivered and picked up varies, depending on the coordinated harvesting schedule which is designed to keep the supply of cane up to crushing requirements. Safe working is by effective 2way radio communication coupled with specific operating procedures and an expert knowledge of the mill's tramway system on the part of traffic officer and loco crews. Our loco today is E M Baldwin BB DH 16 (95621681) built in 1981, with a Niigata torque converter coupled by drive shafts to the four driving axles.The motor is a 500hp 12cylinder GM diesel. The 32ton locomotive can haul a load of 300 tons gross (60 four wheel cane bins) up a 1:33 grade. On the level the loco can pull 300 full bins, each 3 metres in length, making a train length of nearly a kilometre. Heading out from the loco depot we enter the empty bin yard and pick up 110 empties. Our journey will take us to the northern reaches of the mill system, some 24km distant. The mill is built on the southern bank of the Pioneer River, and is normally in a constant state of change and expansion.This has been particularly the case since the merger of all local mills to form the Mackay Sugar Cooperative in 1988, and the closure of nearby North Eton Mill. It is planned to close Cattle Creek Mill, further up the valley, at the end of 1990, and this means that work is already beginning to install a second milling train at Marian. 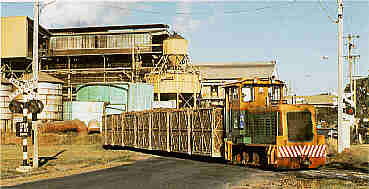 We venture out into the empty yard, cross the main road which separates the mill from the rail yards, cane unloading station and loco shed, then through the mill complex itself and cautiously descend the river bank on a steep grade to cross the Pioneer at just above water level on a low level timber bridge designed to minimise damage at flood times when the water will rise well above. 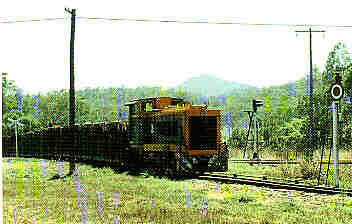 Skill is needed by the loco driver in this crossing, both to control the descent and, at the right moment, power on to climb the steep grade on the other side. Each coupling on the rake of bins has about 25mm slack and you can feel each one of them run out or bump in as the train traverses the steep grades and in stopping and starting. Construction work is starting on a high level road/rail bridge just downstream to replace the old lowlevel bridge and eliminate the bottleneck caused by the restricted train sizes which can be handled on the steep grades. 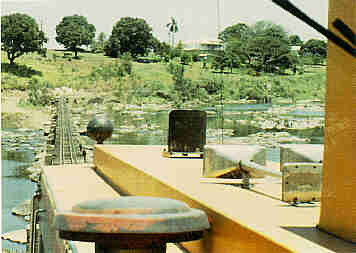 View from the cab as the loco eases onto the low level bridge across the Pioneer River. Once out of the river we traverse undulating country. The rail used on these systems is mostly 60 lb exGovernment 3ft 6in gauge rail from disused branch lines in Queensland and central Australia. This makes heavy track for narrow gauge trains and we continue at a good pace, around 35km/h with a gentle rocking and rolling motion, the loco running cab first on this outward journey. At one spot the rocking and rolling gets a bit much and the loco starts bouncing up and down very hard so that the crew have a job hanging on. We brake, reduce speed and then power up again once the motion has reduced and we are on smoother track. The crew explain that the rubber suspension blocks may be a little soft for poor track conditions, but 99% of the time the suspension is very good. We are following a similar train for a time and its driver uses the twoway radio to let us know where he is and if he is going to stop. At one stage, he calls up for assistance in dropping off some of his empty bins at a siding. With long trains, it is quicker and easier to drop the wagons from the front of the train, but in this case the train is on a down grade and the remaining bins would need "spragging". 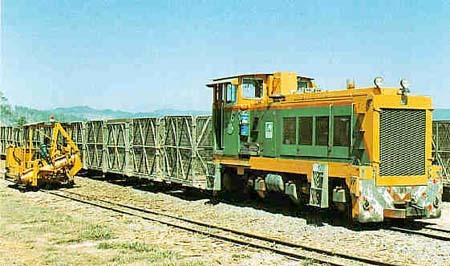 This means braking the uncoupled consist on the main line by placing "sprags", specially made triangular section timber poles with rounded end sections, in the wheels. To make this unnecessary, we close up to the train ahead and couple up to his bins to hold them while he shunts bins from the front into a siding for loading by the farmer's harvesting gang. This not only saves a lot of time for the crew ahead but also for our crew who are keen to get on with their run. We climb over the interesting Messmate Range and pass from the Pioneer River valley to that of Constant Creek. The climb is quite fascinating and we pass through some tropical forest at the summit. Down the other side, we part company from the train ahead at "The junction", when it heads off to the right on the Mt jukes line. We follow the Bruce Highway, the main coastal route from Brisbane to Cairns, which we pass just past Hampden School. At Kuttabull we cross over the Queensland Railways 3ft 6 in gauge main coastal line, with all necessary safeworking procedures. After passing through more pleasant undulating country we arrive at our destination, the terminus at Narpi School, where we drop off and shunt our empty bins. We have to pick up 100 full ones here. The track maintenance crew have stowed their sleeper replacement machine in a siding and will continue their work once we are clear of the area. We assemble our train of full bins and find one with a coupling height problem. We try various other bins to try and couple up but with no luck. The crew decides to leave the bin behind and to radio the mill about the problem. We leave the terminus for the trip back to the mill with 99 fulls. On our return journey we see a mill gang heading down the highway in a road truck to attend to the problem bin. In the back they have several complete wheelsets of slightly different wheel diameters. All they will need to do is to jack up the end of the offending bin and fit another wheelset to produce the appropriate coupler height. Crew's view back down the loaded rake as it snakes along beneath a hot sun. The driver's assistant helps the driver with shunting, safeworking and paperwork, ensuring that bin numbers are correct and match the farmer's consignment notes. Shunting long trains like this means a lot of running back and forth. At the crossing with the QR, the assistant (years ago called the "points boy") checks that the main line track is clear, changes the signals and holds the catchpoints lever. He waits for the cane train to pass, then resets everything back to favour the QR before running back to rejoin the loco. This has been an easy run. At least we are not stopping off at every siding to drop off or pick up bins. We approach the Messmate again, where our maximum load is 60 bins, so we leave 39 in a siding at The Junction, close to the start of the climb, for another loco to bring over later. We continue up over the range and at the top we are at walking speed, with the GM's diesel exhaust screaming among the trees. 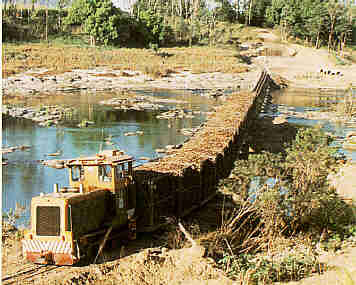 Frequently, the driver applies sand to control slipping. Passing the summit, we run carefully downhill, the driver selecting "braking" on the hydraulic drive to assist the normal air brake in controlling speed. Down the other side of the range, we cross a smaller loco running "light". It will be picking up full bins, commencing with the 39 we have left on the other side of the range, as we continue through the canefields towards the mill. just north of the Pioneer River we cross another train heading out with empty bins before carefully descending onto the river bridge and climbing up the steep bank into the mill. We hear over the twoway that the loco bringing our other 39 bins over the range has had some problems on the down hill section. The first bin has derailed and will need to be uncoupled from the loco to be rerailed. The crew is short of sprags to hold the rake on the downgrade while the rerailing is done, and radios in for some more to be sent out. It is late in the season and most of the supply of sprags has been lost or broken and they are generally scarce. The traffic officer radios the helpful suggestion "Go and cut down some trees", while another driver breaks in to warn "Watch out for the greenies" as the constant chatter over the twoway turns to banter. Through the mill complex, across the highway and past the head of the mill yard we continue. It only remains to reverse the rake into the full yard and then it is back to the loco shed and off for lunch after a hot dusty run of around 4 hours. This is a revised version of an article which first appeared in Narrow Lines, the magazine of the 7mm Narrow Gauge Association. Thanks to Len Heaton for his assistance. Clyde HG3R 0-6-0DH locomotive 14 (61235 of 1961) powers into the climb on the south bank of the Pioneer River. Works have begun for the construction of the new high level road/rail bridge (top right). Clyde 14 has passed through the mill complex and crosses the Eungella Road to enter the mill yard. This page is prepared and maintained for the LRRSA by Frank Stamford and copyright © by LRRSA. Last updated on 11 December 1999.